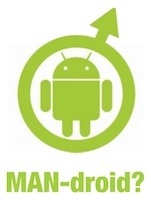 According to last year’s AdMod Mobile Metrics Report, nearly three quarters of Android users are male. Sure, other tech gadgets and smartphone operating systems do tend to show a slight male bias, but why is the percentage of Android female users so dramatically low? And can anything be done to make Android more appealing to women? These were the two key questions I tried to answer while searching for a topic to present at the recent MobileCamp Ljubljana, Android edition. I was pretty sure more than three quarters of the audience at the event would be male (I was correct), so that seemed like a nice topic to explore with the guys, mostly app developers. You can see the slides from my talk embedded below. As the slides attracted quite some interest on SlideShare (my first presentation that got featured on the homepage! ), I also decided to do a little write-up on my blog, to expand on some of the key points. So, why aren’t more girls using Android? What can we do to make Android phones feel right and not (only) a geek device? Who defines the user experience and perception of Android? 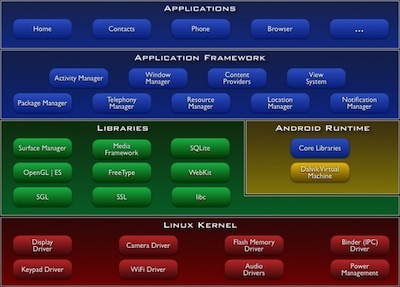 On the basic level we have Google defining core OS functionality and design. On the next level we have various phone manufacturers (HTC, Samsung, Motorola, Sony Ericsson etc. ), who define the hardware characteristics of the devices and can also create their own user interface modifications and software modifications. Together with mobile operators, they’re also the ones that make sure end-users buy their Android devices through ads and promotions. And finally, on top level, we have application developers, who create apps that enhance the functionality of Android phones. Without any doubt, Google has a “cool” status among geeks. We all love free Google services, and the geeks and hackers rejoiced at the announcement of Android, Google’s “open” alternative to Apple’s “evil” iPhone walled garden. In some aspects, Android is trying hard to imitate iOS (the operating system running on iPhones), but on the other hand, it does provide users, manufacturers and developers a bit more freedom when it comes to customizing your device. Ask any true Android geek, and they’ll tell you how awesome their Android phone is if you just install the right ROM (a modified version of the OS). Wait, what? Yeah, it does sound a lot like listening to Linux fans. And we all know that your typical Linux users is certainly not female. Well, the same problem seems to apply to Android. Perhaps the manufacturers, with their unique user interfaces, can make Android look prettier to girls? Well, sort of. To be fair, some manufacturers are really trying to make Android easier to use for us, common people, and not just the geeks, who have the unstoppable urge to hack everything with a chip. For instance, HTC is really trying hard to make Android devices friendly little helpers through HTC Sense. It can do some pretty nifty tricks like ringing louder when it’s tucked in our bags or displaying friends’ latest Facebook status update when they call, so you can instantly tell it’s their birthday. Oh yeah! 30 seconds of pure, raw manpower. Did you get the chance to grab a beer? Ok, to be fair, it’s not a new ad, and some of Motorola’s recent ads are a bit more neutral. But the ad above is an extreme case of a trend we often see when manufacturers and mobile operators promote their Android devices: too much emphasis on technical specifications and forgetting the human touch. Motorola’s Xoom Super Bowl ad was a bit better at making their Android device look more human friendly, but their final tagline still reads “The world first Android 3.0 tablet”. Yawn! But of course, to make ads like this, you also need products that focus on the end-user, who is not necessarily a geek or a hacker. So finally, we reach the apps, the final piece of any modern smartphone puzzle that can make or break the user experience. Here is when I came across some interesting research; according to The Wall Blog, women with smartphones (not such a minority anymore) are twice as likely as men to never have downloaded an app. Hm, that’s a huge gap. When asked for reasons, some of the most common answers given by women were that the they felt overwhelmed by the choice of apps, and that apps were not relevant to them because they didn’t help them or enhanced their lives. So, we clearly have a marketing problem when it comes to selling apps, especially to women. My guess is that this problem is more pronounced in the Android Market, where, due to the lack of strict guidelines, it’s more difficult to find quality apps. Apple is trying to make app discovery easier by providing curated selections of apps. 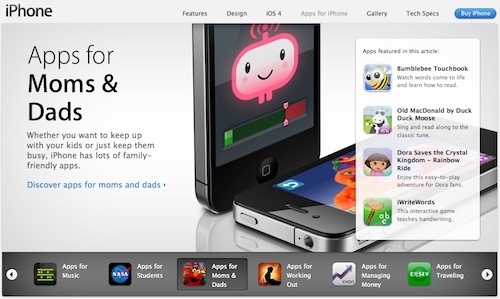 For a good example of this, visit the Apps for iPhone section on Apple’s website, where apps for different needs, such as Apps for Moms and Dads, are clearly presented with big pictures and short descriptions. And you can be pretty sure that apps that make it to this page have been thoroughly tested and will probably make a good purchase. And that is what Android Market could really use. But who will be brave enough to attempt such a massive feat of strength? And how will users find such content, when most of them probably aren’t looking for specialized blogs and sites on the subject? Apple certainly has the advantage of being the one and only company to make their phone, market it and sell apps for it through their own App Store. What do women want from mobile apps? The big question for all app developers is, of course, what do women want from mobile apps? How can we make apps that women will want to download? So, we don’t want clutter, we don’t need extra bling - we want apps that are easy to use and that makes our lives better or easier! Women are probably more likely than men to see their phones as tools that shouldn’t require a manual, but should provide clear value in everyday life. Of course, this doesn’t apply to just women - many users outside the geeky, tech crowd feel the same! And here’s my advice for app developers: focus on everyday usability and experience, not on fancy algorithms and tech talk. Finally, here are 7 key points I wish every app developer, male or female, would keep in mind when planning, designing or programming mobile apps. Make my life better or fun. Don’t make me change for you. I’m looking for experiences, not features. Yes, I like pretty, but I’m not a princess. There are of course several resources anyone can find on the web that can help you better understand how women are using mobile apps. Some interesting sites I recently came across are: LadyGeekTV.com and WomenWithDroids.com. And in the comments, I’d love to hear from more women using smartphones (Android or other) and particularly your experience with mobile apps. Android and mobile app development might still be a man’s world, but we can try to change things by speaking out about what we do and don’t like.